I’m keen on the railroad, I tell people who ask, because of its role in building Canada, especially here, where Confederation could not have happened without this track being laid. But it’s more than national pride. It’s a matter of personal history and more than 40 years of stories that touch rail to one degree or another. I think of riding the train cross-country as an eight-year-old, with a new doll with a plastic head and plush pink body. She had a cord on the back — pull it and her head moved and body wriggled like a real baby. As older teenagers, Melani and I boxed up our bicycles and took the overnight train to Moncton — the Hub City that is the end of the line and as far as you can go by rail if your destination is Prince Edward Island. As a 24-year-old, this time with a real baby, four-month-old Trevor, and a deep desire to show him to spread-out family, and introduce him to the most beautiful land I know. Half a year later, he would learn to walk on a train, headed home from the Maritimes again on the Ocean, which was named here as a line on the Intercolonial Railway. Amherst, long a shipbuilding centre and home to four fathers of Confederation, was not built by the railroad, as many Canadian towns were. Yet it owes much of its growth to that technology. The Intercolonial Railway was dreamed up around 1840. It would be a road linking Nova Scotia and New Brunswick — isolated by land, sea, and a sliver of Maine — with the Province of Canada, then just Quebec and Ontario. Such a road would take a northern route, smoothing the transport of military supplies in case relations heated with the Americans again, as they had in 1812, and respecting the United States Act during the U.S. Civil War. In theory it was a genius plan. But it was also a rich plan, and who on earth could pay for it? The four regions started laying track separately and hopefully, waiting for a solution to materialize. That solution was Confederation itself, with the building of the Intercolonial Railway being inscribed as condition of the union of this eastern half of what is now Canada. It thus became the first major Crown corporation and the biggest infrastructure and transport project of its time. There is debate over the reasons the Intercolonial wiggled and wound its way through Nova Scotia and New Brunswick: Was it to bring the railroad to logging communities and more effectively avoid the United States and their just-ended Civil War, or was it a sign of corruption, and the towns’ foresight in wanting track through their blooming towns? 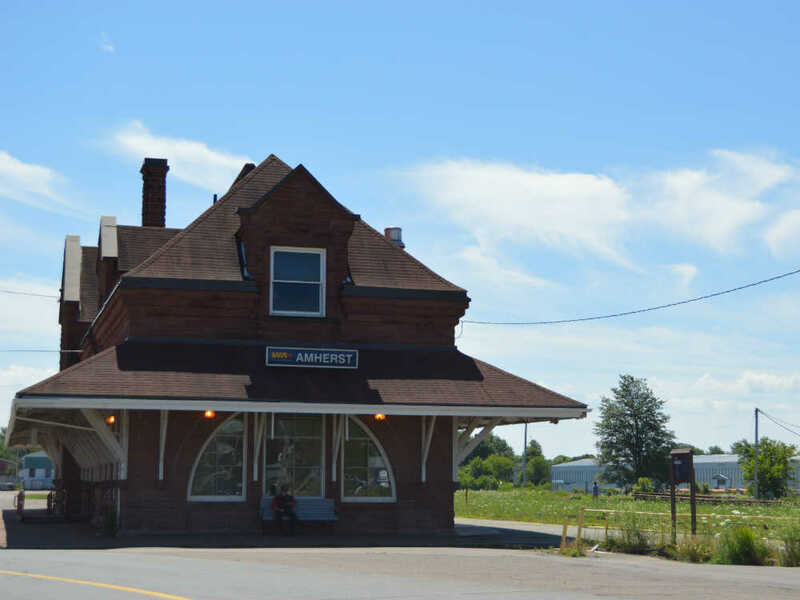 Whether politically motivated or through the intelligent design of chief engineer Sir Sandford Fleming, a wooden train station was built in Amherst to accommodate the opening of the grand project, which boasted the best quality construction with raised rail beds and iron bridges. It was 1,100 kilometres long when it was deemed ready to roll in the mid-1870s. Amherst was a boom town with the world at its feet. It replaced its little wooden train station with the lovely red sandstone building that stands today, a glory of local supplies and craftsmanship. All good things come with a price, and for Amherst that marker was called in 1910, when its beautiful station was still fresh stone. The nation experienced a downturn, and of course those are always felt more heavily in the Maritimes. Nine years later, workers called a general strike over worsening conditions and in solidarity with the great strike in Winnipeg at that time. The Intercolonial, which in its prime had swallowed the Grand Trunk Railway, was in turn swallowed by the Canadian National Railway. The tracks were eventually turned over to passenger service Via Rail, which uses them to this day. But the station is shuttered. Its whitewashed beams show signs of dirt as they must have when steam trains were the most heavily seen traffic. It’s a stop on the route inland, but there is no glory here except in the whisper of ghosts and the imaginings of a train whistle heralding prosperity, so very very long ago. I don’t know, but if you find out something, I’d love to hear about it.